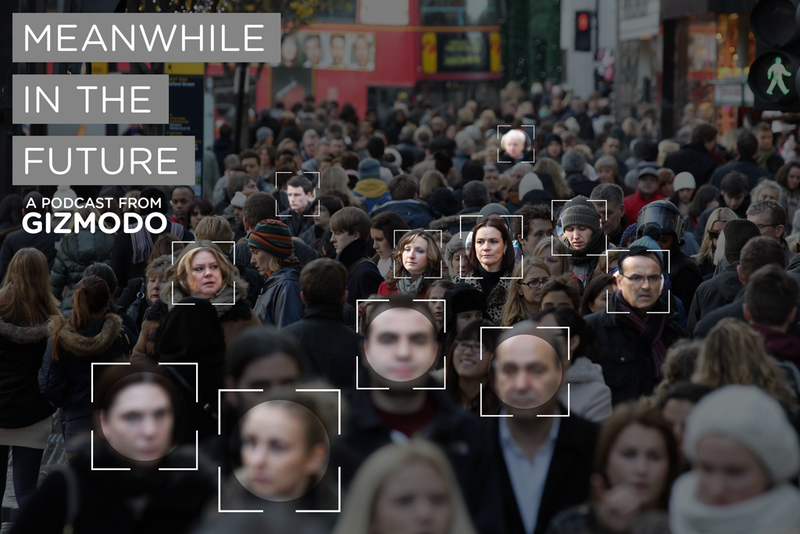 This week, we go to a world where facial recognition is so good that any company can grab an image of your face while you’re walking down the street, and link it to everything from your social media profiles, to your credit score, to your workplace. This world really isn’t that far away. In this episode, I talked to Robinson Meyer, who explained that online teams at Facebook can identify your face in photos with “near human accuracy.” Not only that, but they can identify you in photos with 83 percent accuracy when your face isn’t even in the picture. In the wild, facial recognition technology is a little bit further out, maybe five to ten years. But the challenges facing on-the-street recognition aren’t all that big. There’s no database of faces to pull from — but companies could easily build one. Databases that big tend to return false positives — but developers would train them to hone in on other clues about you to narrow down the options. Computers aren’t quite fast enough to do the processing — but they will be eventually. Meyer recently covered a big blowup between industry representatives and privacy groups. The two sides had been in talks for a while, trying to set up some best practices, or guidelines for how companies could and should use facial recognition. But the talks totally broke down in June. Basically, the two sides simply could not agree on how to deal with this scenario: Let’s say you’re walking down the street, maybe in your neighborhood. A camera owned by a company you’ve never interacted with, never bought anything from, never even accidentally clicked on one of their ads online, captures an image of your face. Does that company need to get your consent before they use that image? Before they can connect it to your online profile? Consumer privacy groups said yes. Lobbyists said no. And the talks stopped. Consumer privacy groups walked out. The other voice you’ll hear in this week’s episode is Alvaro Bedoya, a law professor at Georgetown University. He was one of the leaders on the consumer advocacy side of this debate, who walked out on the talks. The weird part about this is that right now, most companies using facial recognition technology, actually do have some form of consent getting. Facebook opts you in, but you can opt out. Microsoft asks for your consent before adding you. But making that a rule, or even just a general guide, was what halted these talks. So what happens if companies continue to build and use these systems without any kind of rules or regulations? There could be some positive outcomes. We could enter into a totally frictionless world—pay for your coffee using your face! Open doors with your face! Pass through borders with your face! Unlock your car with your face! That would be pretty convenient. But there are also some negative outcomes. Your face is, perhaps, one of the most valuable things you own because you can’t really change it. Once someone can connect your face and your body to your digital profile, that connection is nearly impossible to shake. You can change credit card numbers, or even get a new social security number (it’s not easy, but it’s possible) but getting a new face is, literally, a major operation. Even if you wanted to use a pseudonym on something like a forum or a dating profile, once the computers know your face, they don’t need anything else. Bedoya and Meyer run through a few other ways this might impact people, as well as what kinds of regulations the United States currently has surrounding biometric data. So you should listen to the episode! Bonus: Meyer tells us about what it’s like to wear Dazzle face paint around to confuse computers.